OYN-X Falcon 4CH Hybrid HDCVI-TVI-AHD-CVBS 4K 8MP DVR Recorder Falcon 4K hybrid recorders are excellent CCTV DVR's, featuring multiple format recording so compatible with four HD camera formats, HDTVI, HDCVI, AHD and 960H/CVBS. OYN-X Falcon 8CH Hybrid HDCVI-TVI-AHD-CVBS 4K 8MP DVR Recorder Falcon 4K hybrid recorders are excellent CCTV DVR's, featuring multiple format recording so compatible with four HD camera formats, HDTVI, HDCVI, AHD and 960H/CVBS. 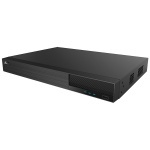 OYN-X Falcon 16CH Hybrid HDCVI-TVI-AHD-CVBS 4K 8MP DVR Recorder Falcon 4K hybrid recorders are excellent CCTV DVR's, featuring multiple format recording so compatible with four HD camera formats, HDTVI, HDCVI, AHD and 960H/CVBS.